A streetscape in Laramie's historic downtown. Laramie, Wyoming, (population 27,200) was founded in 1860 as a tent city near the Union Pacific portion of the first transcontinental railroad. When the first train arrived in May 1868, it brought respectable citizens from the East along with shadier travelers trying to stay one step ahead of the law. Four hundred town lots were sold in just two weeks. By autumn, Laramie boasted a public school, three churches, and a national bank. By the time Wyoming became the 44th state in 1890, Laramie’s residential neighborhoods were filling up with simple houses and elaborate Victorian homes—many of which, along with the historic downtown district, are listed on the National Register of Historic Places. Today, Laramie is home of the University of Wyoming, the state’s only four-year institution of higher education. 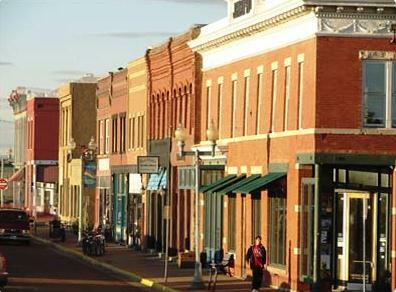 Laramie offers visitors a series of walking/driving tour guides featuring different elements of the community’s cultural heritage, including architecture, museums, and the historic Downtown. The Laramie Plains Museum, located in a nationally listed Victorian mansion, houses a comprehensive collection of period antiques. Another attraction is the 1872 Wyoming Territorial Prison, a State Historic Site, which held some of the most notorious outlaws in the region, including Butch Cassidy. The Laramie Railroad Depot Museum interprets the area’s railroad heritage and features a restored Craftsman-style ceiling. Each July, Laramie celebrates the state’s admittance to the Union as the 44th state with Jubilee Days, featuring a rodeo, street dance, street vendors, and a carnival.